How big is the map in 'Zelda: Breath of the Wild'? Bigger than 'Skyrim' and 'Witcher 3'? The Legend of Zelda: Breath of the Wild brings an open-world feel to one of Nintendo&apos;s most popular titles. Instead of guiding you carefully from one dungeon to the next, the new game puts the responsibility on the player to plot their own journey. And it really is a journey, requiring you to walk, run, jump, glide, swim, ride and climb to get from one town to the next. So, exactly how big is the map in Zelda: Breath of the Wild? To find out, players have compared it to some of the most popular open-world video games in recent memory. Here&apos;s what they learned about the Zelda: Breath of the Wild map. If Hyrule seems gargantuan to you in size, it&apos;s for a reason. We first saw rumors of Breath of the Wild&apos;s map being bigger than Skyrim — Bethesda&apos;s open-world classic — back in January. Now it&apos;s been confirmed. Reddit user noob10 has done the math. Assuming 90% of the map is traversable and the average person takes 10 minutes to jog a mile, we can get a rough estimate of the world&apos;s size. Noob10 noted it takes 28 minutes to jog north to south and 33 minutes east to west. If you multiply 33 x 28 x .90 (to account for the percent of playable land), you arrive at about 832 square minutes in the game. After some quick converting, noob10 determined the land is 8.3 square miles — at an estimated 5,300 acres, Breath of the Wild is smaller than Manhattan, a borough of New York City. By this measure, it&apos;s tough to comfortably say Breath of the Wild is 1.5 times the size of Skyrim — or any bigger than the latest Witcher 3, for that matter. But when using Google Earth and computer-aided design mockups instead of jogging to calculate the map&apos;s distance, you end up with a different amount that starts to hint at the game&apos;s true scale. Looking through the math, we&apos;d rather stick to the visual aid on this one. I took a map of Kyoto and overlaid it on the game world, and I tried to imagine going to places that I know in Kyoto. 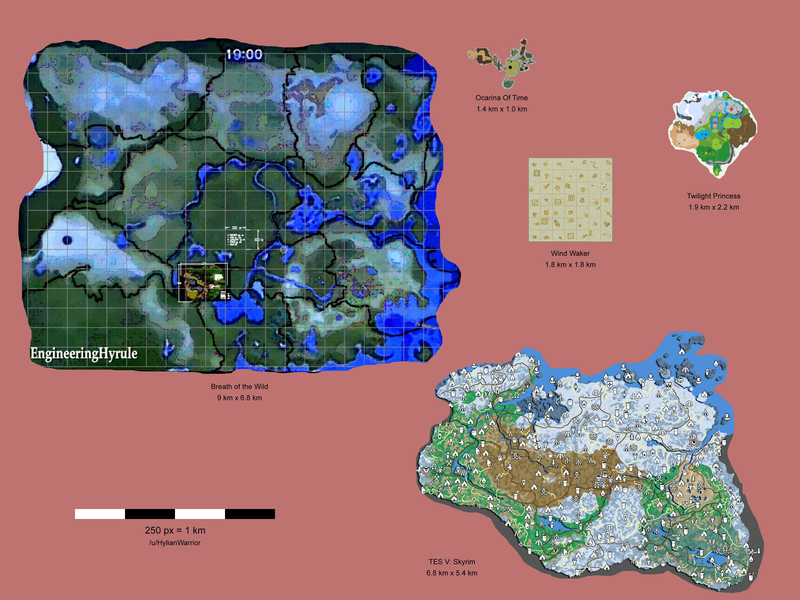 I&apos;d think, &apos;It takes this much time to get from point A to point B, so how does that translate to the game?&apos; And that&apos;s how we started mapping out the world in Breath of the Wild. This isn&apos;t the first time one of Nintendo&apos;s titles took inspiration from a region of Japan. Many of Pokémon&apos;s early regions — as seen in Red and Blue and Gold and Silver — were based on Japan&apos;s Kansai region, Chubu region and more. Kanto, the setting in the first Pokémon game, is literally named after the part of Japan on which it&apos;s based. Let&apos;s hope Zelda&apos;s choice of being based on an actual area of Japan spills over into Pokémon Stars if and when it reaches the Switch. Find out all there is to know about Zelda: Breath of the Wild, including what to expect from the Wii U version, where the great fairies are, how to preserve your items, how to beat bosses like the Stone Talus and Lynel, the best recipes for Link and how to take on the game&apos;s shrines.